Without the Owner’s prior written consent, no bird or pet shall be kept in the premises any repair or decoration will take the permission of the landlord in contrast the tenants must visit the property prior tenancy period to ensure that all the facilities stated in the agreement actually exist. 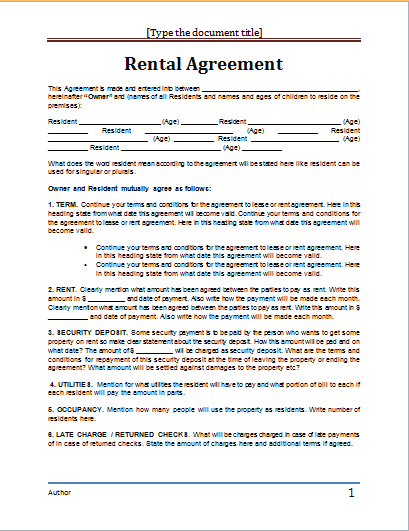 Another form of the rental agreement includes a rent-to-own agreement which is a contract to purchase or buy the rental property. It gives the tenant the opportunity to buy the home at a fixed price in a fixed time. In this case, the tenants can pay non-refundable charges to buy the land lord’s property at a fixed price. You can make your rental agreement via downloading free rental agreements available online with customizable options fit for your need.